I decided to try a couple more food stamping projects and was very pleased with the results. 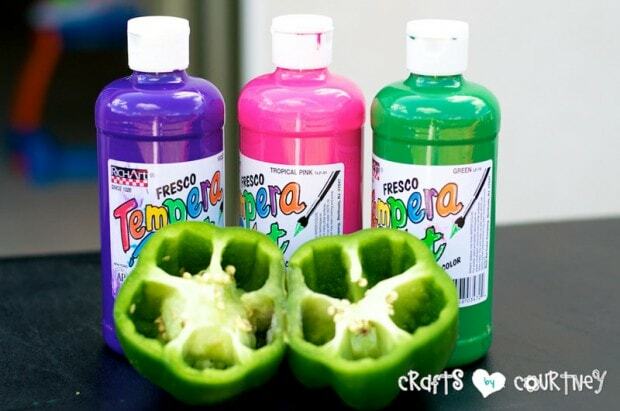 I thought pepper stamping was another great idea and we always have peppers in the house. My husband and kids love to snack on them. One thing I loved about the pepper stamping is it looks like a flower. Who knew right? AND this project was another easy and basically free since we already had peppers on hand. I got a couple peppers and had my son pick out the paint colors he wanted to use. It’s very easy to get the peppers ready. All you need to do is cut them in half and pull out all the seeds. I really tried to keep the center in tack to create a nice shape for the flower. 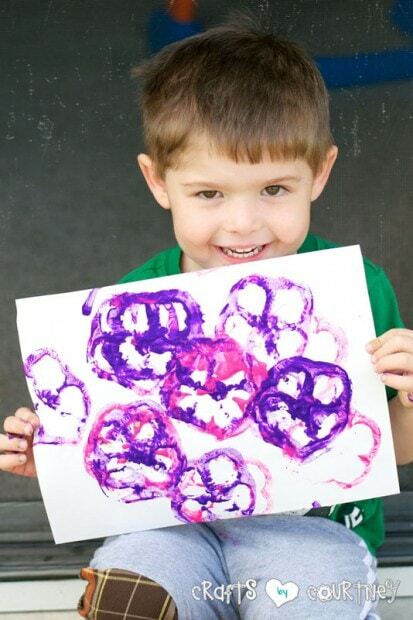 I had my son dip the pepper in the paint and start creating flowers all over the paper. He did a great job and the shapes turned out awesome. I can see this idea used for so many things. Quick Tip: Just make sure that the pepper is completely covered so you get a nice flower shape. My son was so excited with how his flowers turned out. If you want, you can add steams to your flowers. Look at that little face! He loved it! Pepper stamping was such a fun craft to do. If you like this craft then you’ll have to check out our celery stamping craft we also did!